With increasing amounts of time spent in front of computers for much of the working population, the importance of supportive seating in the office has never been greater. Working comfortably is only one aspect of an ergonomic chair, the real benefits come in the form of increased health and productivity. 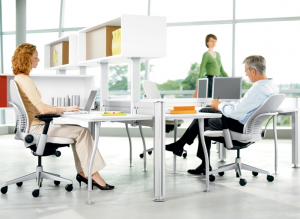 Steelcase, one of the leading manufacturers of office chairs, commissioned two studies in order to quantify the benefits of investment into state of the art seating technology. The purpose of their research was to look at the real benefit of the ergonomic program, to ask whether increased productivity is possible, and how soon this productivity yields a return on investment for the company. The chair that Steelcase used in these tests was their Leap chair, which had been designed using in depth understanding of the human body and how to support it. Biomechanic tests had already proven outstanding fit, movement and support but they also wanted to test it in a ‘real world’ setting alongside ergonomic training for the chair users. The results confirmed that the Steelcase Leap office chair and the training given resulted in significant health status and productivity improvements. Those with Leap chairs demonstrated more overall comfort which lasted longer through the day. Productivity went up in both the companies where the studies took place: the public sector company showed increases of 17.8% and the private sector productivity went up by 8.3%. No significant productivity was evident in the other 2 groups studied. The results of this study demonstrate the good business sense of investmenting in quality furniture and training. 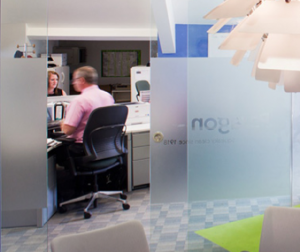 Ergonomic office seating is an asset to an organisation and is appreciated by its staff. Shown on the left is the Steelcase Leap office chair in use at Paragon Laundry.